An important fact has been missing in the discussion about school consolidation: the high quality of the Starkville School District. As legislators and others ponder how best to approach the inevitable consolidation, they must not lose sight of the incredible quality that defines the public schools in Starkville. Simply put, the Starkville School District is one of the most outstanding in the state. Starkville’s public school students and faculty compete well against the best in the state and the nation. Want evidence? On the 2012 Advanced Placement European History national exam, 11 of the 21 students who scored a 5 (the highest score) in the state of Mississippi were students at Starkville High School. That’s more than Jackson Prep and Jackson Academy combined, and is a trend that goes back more than a decade! Starkville students are well represented in the MSU Presidential Scholars Program (formerly called Distinguished Scholars). Three of the 13 newest recipients of MSU’s most prestigious, most selective scholarship are from Starkville High School. SHS’s finalists are the most from any public or private high school, not only in Mississippi but throughout the U.S. In addition, another SHS student was recently named a John C. Stennis Scholar at MSU. An SHS student was just accepted to the United States Naval Academy. Two SHS alumni will graduate this spring from the Naval Academy and the United States Military Academy at West Point. Speaking of the military, the JROTC Rifle team won overall first place in the Vicksburg Rifle Match. An SHS student was named Mississippi Journalist of the Year by the Journalism Education Association. Another earned first place in the Mississippi Poetry Out Loud Contest and will represent our state in Washington, D.C. this spring. Still another represented Mississippi in the 51st annual United States Senate Youth Program in Washington, D.C.
An SHS senior was one of two Mississippi delegates to Boys Nation. He also was honored by Mississippi Secretary of State Delbert Hosemann, who also recognized Starkville High School as the Model Promote the Vote School Program for the state of Mississippi. SHS was selected from a large number of schools across the state who participated in Promote the Vote. Last October, in only its second year of existence, the Millsaps Robotics Club won the Mississippi BEST (Boosting Engineering in Science and Technology) Robotics championship. They then placed eighth (out of 57) at the southeastern BEST regional competition in Auburn, Alabama. To put this accomplishment into perspective, no team from Mississippi had ever previously placed in the top half at the southeastern regional competition. The Starkville School District’s nationally recognized fine arts programs continue to produce award winning student artists. From exhibits at the Mississippi Museum of Art and the U.S. Capitol to the stage of the Mississippi Theatre Association’s State Festival, SHS students represent some of the most creative talent in the state and throughout the region. Did you know 22 SHS singers were named to the Mississippi All State Honor Choir? That’s the most from any high school in the state. All 22 who auditioned were selected! Last year, Starkville was named the state’s top athletic program for the 2011-12 school year in Class 5A (outpacing Oxford), and followed that up this school year by winning the 5A state championship in football. The SHS band received superior ratings (again!) at state competition and earned the Sweepstakes Award, which recognizes bands with all superior ratings in every category from every judge. 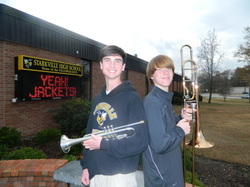 Three members of the SHS band will perform as part of the Mississippi Lions All-State Band in Europe this summer. Students at Armstrong Middle School won 16 awards including six Top Honors and Best of Fair at the Region V Science and Engineering Fair. Students at AMS won the National History Day Quiz Bowl, and the school itself was named Top National History Day Middle School in Mississippi. The Starkville School District has 54 nationally board certified teachers, which ranks it among the top in the state. The faculty also has produced the Mississippi Teacher of the Year, Thad Cochran Distinguished Arts Educator of the Year, School Newspaper Adviser of the Year, John K. Bettersworth History Teacher of the Year and many more. The Starkville School District has excellent leadership, faculty and students. The results of their efforts speak for themselves. As discussions begin about the finances, governance, infrastructure and other issues related to consolidation, let’s not lose sight of the fact that we are fortunate to live in a community that has one of the most outstanding school districts in the state of Mississippi.